Still have questions? Please call us 888.636.8162 or text us at 734.436.2006 or email service@zingermans.com. How do you source your foods? Where can I subscribe to your e-news? Could you please remove me from your mailing list? 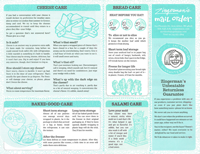 Who illustrates Zingerman's catalogs and website? Who writes Zingerman's catalogs and website? Who designs Zingerman's catalogs and website? What's the Frequent Foodie program? Where can I send love notes and suggestions? Can I download an order form to send to you? 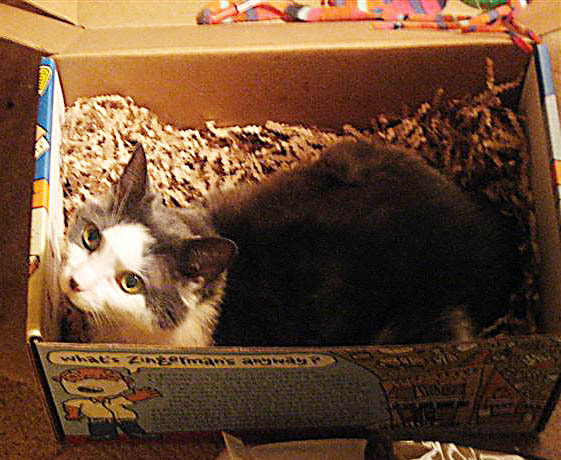 I'm sending a gift - will the prices appear anywhere in the box? What does your packing slip look like? Do you have a blank card I can download to print and put with my gift? What gift packaging options do I have? What happens if the product I want is "sold out"? I know something you should stock! Can I send something from another Zingerman’s business? How should I keep my bread? How should I care for my cheese? How should I care for my baked goods or coffee cake? How should I keep my olive oil? How do you know your olive oil is real and unadulterated? How should I care for my salami? What is "flat rate" shipping? Can I choose the date my box arrives? Can my box ship out on the same day? Do you require a signature when the box arrives? Do you ship boxes out of your warehouse on Saturdays and Sundays? Can you ship to P. O. Boxes? Do you deliver to Alaska & Hawaii? What options do you have for local delivery in Ann Arbor? Why doesn't bread ship for flat rate? In the traditional sense, no. We are dedicated to growing thriving, food-related businesses in the Ann Arbor area. Each is unique, not part of a franchise. We invite entrepreneurs with a passion for food and a commitment to our mission and guiding principles to join us. Each business we've started was inspired by—and is led by—entrepreneurs. We do not create business concepts then find partners. The partners come to us with an idea and work to build it themselves, with help from our community of businesses. You can learn more about Zingerman's Community of Businesses here. If you are serious about building a food business in Ann Arbor and want to be part of Zingerman's, we welcome all discussions. 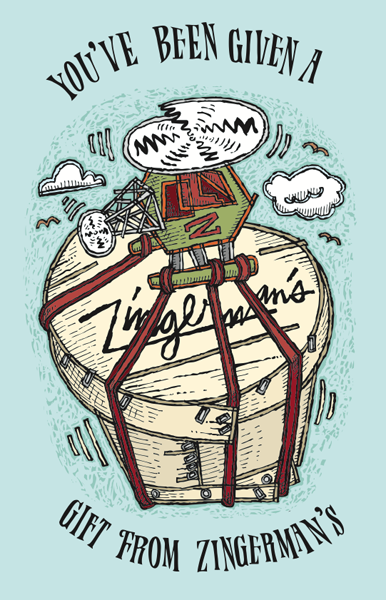 Email Paul Saginaw, Zingerman's co-founder, at psaginaw@zingermans.com. We keep our selection tight and focused. We want to help you find what you're looking for faster and easier. We taste thousands of different foods each year, selecting only dozens, so we can narrow down to what we think is the tastiest. If you have a food that you would like to share with us, please email Brad Hedeman at bhedeman@zingermans.com. 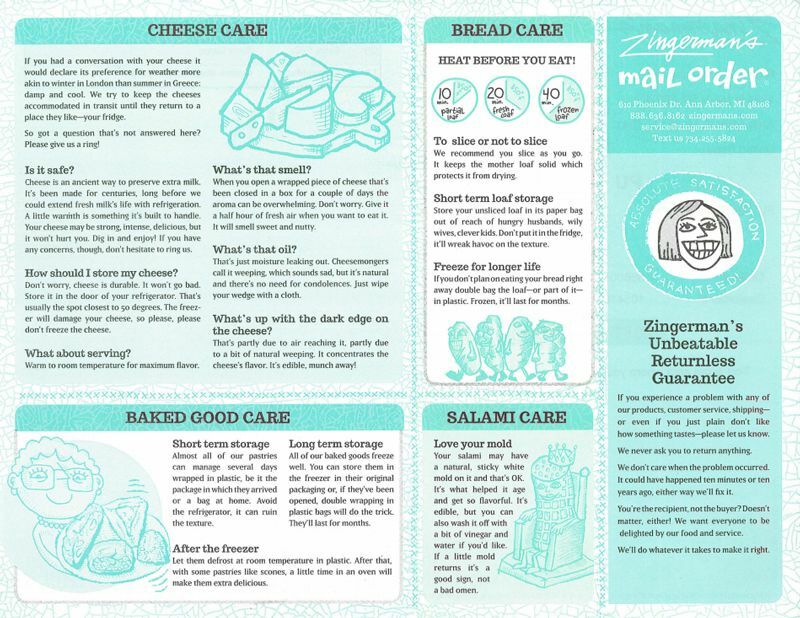 Zingerman's gives to a variety of causes. Our main philanthropic mission is to help end hunger in Washtenaw County, Michigan. We founded Food Gatherers in 1988 and continue to give them the majority of our philanthropic and volunteer support, regardless of the level of our profits. If you have a contribution request for your organization you can learn more about our giving and request a donation here. Yes, absolutely. Zingerman's specializes in delicious custom food gifts for any size gift list. If you have one, one hundred, or one thousand clients, we can help. Your corporate gifts are handled by your own personal shopping concierge. Order in advance; we guarantee arrival by the date you want. Fill in this form. We'll put a catalog in the mail right away. It should be with you in less than two weeks. And in the meantime, you can check out our current catalog online. Zingerman's E-news comes out once or twice a week, on average. We share new food finds and offer deals for shopping online you won't find anywhere else. Ian Nagy has been an illustrator at Zingerman's for 25 years. He's an avid fan of outsider and children's art. His influences include Kate Uleman, Ben Shahn, Matisse, Jean-Michel Basquiat, Gary Panter and that of his family; mother, sister and father. A concise history of his work and more images at www.iannagy.com. Ryan Stiner attended the School of the Art Institute of Chicago and started illustrating for Zingerman's in 2005. Inspirations are Istvan Banyai, Justin Bua, Jasper Johns and Gerhard Richter. See more of Ryan's work at www.ryanstiner.com. Our website and catalog also includes drawings by Britney Leal, Alyssa Olson, Nick Jaroch, Raúl Peña, William Charley, Kate Uleman, Phil Stead and Adam Forman. We will confirm your request by email. We may mail one or two more catalogs before the change goes into effect at our mail house. If you'd like to stop mailings from other catalogs you can do that here. If you spend enough to earn a prize we'll let you know. It's that easy! No membership fee. No account number. No pin. No need to even sign up! You will rack up Frequent Foodie points by eating your way through our catalog and website. Every dollar you spend — on yourself or as a gift purchase — counts towards a Zingerman's Gift Card. Frequent Foodie qualifying period is October 1 to September 30 of the following year. If you experience a problem with any of our products, customer service, shipping — or even if you just plain don't like how it tastes — please let us know. We'll do whatever it takes to make it right for you. And we'll never ask you to return anything. Customer service is our passion, our charge and our mission. Stuff happens. Things go wrong. We consider it an honor when you let us help fix a problem. Whatever the problem we’ll fix it immediately, no questions asked. Every one of our staff is authorized to do whatever it takes to make it right for you. While we welcome any requests to speak to a supervisor, manager or owner, you never have to pull rank in order to get things taken care of at Zingerman's. We never ask you to return anything. That means you can shop with us and try something new without worrying you'll have to re-pack the box and send it back if you don't like it. We don’t care when the problem occurred. We’ll refund or replace anything no matter when we let you down. If you don’t like how it tastes, that’s good enough for us. We’ll refund your hard earned cash or send you something you’d enjoy more. We don't have any "policies." No "if this happened, then we'll do that." We do what you want. If you'd like us to refund the order, consider it done, no problem. Want us to replace it? Absolutely! Want something else instead? Sounds great – let's find something tasty. Just want to talk and give us some suggestions for improvement? Thank you, we'll listen! You’re the recipient, not the buyer? Doesn’t matter! We want everyone to be delighted by our food and service. If anything is wrong, please contact us so we can make things right. We guarantee your order will arrive on or before the day you select. We know you often rely on the food to make a birthday special or a dinner come off without a hitch. If shipping gets in the way we promise we’ll cover you. Our guarantee doesn’t just cover food. We ensure your satisfaction with every part of your experience with Zingerman’s. From picking up the phone, to the first mouse click on your computer, until you finish the last bite of bread—If you aren’t completely satisfied with every part of the journey please contact us. We want to hear about the problem. We’d love the opportunity to make you happy. We'll take care of any issue that comes up, and we'll never ask you to return anything. If you have a problem, please email service@zingermans.com or call 888.636.8162. Need a quick answer? Text 734.436.2006 and we'll help! We welcome hearing from you. Send an email to tell us what you liked, or what you'd like to be better. Sure - here it is! 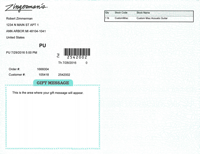 Zingerman's Mail Order form for one or two recipients (duplicate for more recipients). All Zingermans.com transactions take place on a secure server. Your information is encrypted before it is sent through the Internet. If you don't feel comfortable sending your credit card information over the Internet, no problem. Call 888.636.8162 and we will happily take care of your order over the phone. We know this is a sensitive issue. We take your privacy very seriously. To that end, we have a privacy statement that we live by. We use personal IP addresses to help diagnose problems with our server and to administer our Web site. Your IP address is used to help identify you and your shopping cart. Our site uses an order form to request information, products, and services. We collect customers' contact information (like their email address), and financial information (like credit card numbers). Customer contact information may be used to get in touch with the visitor when necessary. You may opt out of receiving any future mailings by post or email at any time. Unsubscribe from email here. Unsubscribe from post by emailing service@zingermans.com. In the future we may choose to use online surveys or contests in which we will use customer's contact information (like their email address). If you have any questions about this privacy statement, the practices of this site or your dealings with this Web site you can use the contact information below. No. We include a packing slip that lists the products you purchased but not how much they cost. The value of your gift stays a secret, between you, me, and your credit card company. We don't include catalogs in gift boxes, either. Click an image to see what the packing slip included in your box looks like. Download, print and fold this to make a quick Zingerman's gift card you can hand to a lucky someone in person. My first question to you would be: did you find it online? There are a bunch of websites out there that claim to have Zingerman's coupons. The truth is that we never post discounts online. While it's flattering that other sites choose to post about us we don't have any control over what they choose to say. The discount codes posted to websites like those aren't generated by us, and they don't work on our website. If your discount code came from some other source (like something you got in the regular old mail) and it's not working, please give us a call at 888.636.8162 or shoot us an email at service@zingermans.com and we'll do our best to help. And we usually have at least a few foods on sale that might tickle your tastebuds. Yes! Choose the Continue as Guest option when you add items to your cart and click Checkout buttion. Absolutely! We love to customize. We have a selection of boxes you can customize online. If you'd like to change one ingredient in another box, or create a gift box from scratch, we can help with that, too. We can even include your own materials or logos, if you like. Ring 888.636.8162 or text 734.436.2006 and we'll take care of you. For many reasons we recommend using our recipes, especially for gift baskets, since they're designed to look nice upon arrival. But we understand there are many special needs you may have. We want to help! We package our gifts in three different ways. The choice is described in the description of the gift. Dufeck, in Denmark, Wisconsin, is that state's last wooden cheese box maker - and perhaps the last in the country. Now in its fourth generation, the folks there have been peeling wood veneer off local trees to make round boxes for cheddar since 1912. The crates are handsome, sturdy and - beyond holding foods like our Classic Sour Cream Coffee Cake - quite handy for storing sewing supplies, old photos and antique socks. Thick-walled recycled cardboard boxes, covered in cartoons of cowboys, octopi, monkeys, flying loaves of bread and more. The largest holds our most popular gift box, The Weekender. And cats. 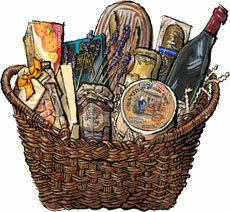 Classic woven gift baskets, like we use for our Ultimate Gift Basket. Plastic or electronic, we sell both. Redeemable at any Zingerman's business, they never expire and we don't charge fees as they age. Check your Zingerman's gift card balance here. Usually we have a pretty good idea of when the next shipment of a "sold out" item will be arriving at our doors. If you don't see that information online yet, you can email service@zingermans.com or call 888.636.8162 or text 734.436.2006 to find out. Why is it sold out? We source most of the food we sell from artisan producers. Some of them are located far away and we directly import from them a few times a year. Some are much closer — Zingerman's Bakehouse is just down the street — and we order from them almost every day. Almost all of them make their products in small batches and encounter the difficult problems of being a small food maker. Sometimes we ring to place an order and they're just plain out of stock. Mother Nature wreaks havoc on raw materials. Supplies run out or are inconsistent. And so on. We try not to keep a lot of stock in our warehouse. That's not because we're being stingy. Many of our producers make or package to order. By ordering in small amounts, what you get to enjoy is much more fresh. Usually, yes! Please call 888.636.8162 or text 734.436.2006 or email service@zingermans.com. Zingerman's exclusives are foods we acquire directly from the maker, usually family-owned businesses working on a very small scale. You can't find these items anywhere else but Zingerman's. Zingerman's is not a Kosher deli or bakery. We do sell some Kosher items made by others, however. Even though your Zingerman’s bread may feel hard upon arrival it’s almost magical how well it returns to that “fresh-baked” status with a little time in the oven. Crispy, thick crust; soft, chewy crumb inside. Starting with frozen bread? Let it defrost on the counter for 30 minutes, then follow these same directions. We recommend you slice loaves as you go. It keeps the mother loaf solid which protects it from drying. If you get on a roll and slice the whole loaf--or more than your guests eat--store slices in a plastic bag at room temperature but keep the unsliced loaf in paper. Store your loaf in its paper bag out of reach of hungry husbands, wily wives, clever kids. Don't put it in the fridge, it'll wreak havoc on the texture. If your loaf is sliced it's best to wrap it in a plastic bag so it doesn't dry out. If you don't plan on eating your bread right away, double bag the loaf--or part of it--in plastic and freeze. When you're ready to enjoy it remove the plastic bags and follow the heating steps above. Head here to find nutrition information on all our breads. If you had a conversation with your cheese it might declare a preference for weather more akin to winter in London than summer in Greece: moist and cool. We try to keep the cheeses accommodated in transit until they return to a place they like—your fridge—but during the trip things are a bit out of our control. These are handmade cheeses that many people aren't used to seeing so it might mean you have a few questions. Here are some answers to those most frequently asked. Got a question that's not answered here? Please give us a ring at 888.636.8162! Cheese is an ancient way to preserve extra milk. It's been made for centuries, long before we could extend fresh milk's life with refrigeration. A little warmth is something it's built to handle. Your cheese may be strong, intense, delicious, but it won't hurt you. Dig in and enjoy! If you have any concerns, though, don't hesitate to ring us. After we hand-cut each piece of cheese to order in our cheese cave, we pack them in bags made of special cheese paper. The paper allow the cheese to breathe which helps it to maintain great flavor. Keep the cheese in that bag in your fridge to help it keep better for longer. Give your cheese 20 to 30 minutes to come to room temperature before you serve it. It makes a world of difference, the flavors become fuller. When you open a wrapped piece of cheese that's been closed in a box for two days the aroma can be overwhelming. The tight quarters don't let it breathe well. Don't worry. Give it a half hour of fresh air when you want to eat it. It will smell sweet and nutty. That's just moisture leaking out. Cheesemongers call it weeping, which sounds sad, but it's natural and there's no need for condolences. Just wipe your wedge with a cloth. What's up with the dark edge on the cheese? That's partly due to air reaching it, partly due to a bit of natural weeping. It concentrates the cheese's flavor. It's edible, munch away! Almost all of our pastries and coffee cakes are happy at room temperature for a few days or more wrapped in plastic, be it the packaging they arrived in or a bag at home. Avoid the refrigerator, it can ruin the texture. All of our baked goods freeze well. You can store them in the freezer in their original packaging or, if they've been opened, double wrapping in plastic bags will do the trick. Let them defrost at room temperature in plastic. That's all you need to do--though with some pastries like scones, a little time in an oven will make them extra delicious. As a very flexible rule, extra virgin olive oil can be stored for about a year. Keep it in a relatively cool, dark place. Heat and light are enemies, so stay away from window sills and stove sides. There's no need to refrigerate, in fact, we recommend you avoid it. Every couple years it seems a big news story breaks that warns us of the dangers of adulterated extra virgin olive oil. The oils in these stories come from producers who are blending olive oils from many sources, mixing less expensive oils, possibly not from the region they say they are, possibly not extra virgin. By doing so they cut costs, but they also drastically cut the quality of the oil. While these diluted olive oils are no longer Extra Virgin Olive Oils, that's what their label says. This is totally illegal, but it's not uncommon in the Big Olive Oil Industry. So how do we know that Zingerman's olive oils aren't subject to this kind of adulteration? For starters, we don't buy from the Big Olive Oil Industry. We don't really even buy from the Medium Olive Oil Industry. With very few exceptions, we're buying our oils from farmers directly. They make olive oil using only the olives grown on their own estates. Most produce only a couple thousand bottles annually, as compared to the millions of bottles that come from the big companies, and they laugh at the idea that they're importing containers of cheap oil to make a buck. We've visited most of them and, frankly, when you see the small scale of their production and the handiwork that goes into it, it's no surprise that they're baffled. Last but not least, we taste every single olive oil many times a year to make sure that the quality is still up to snuff. You really can taste the difference. I make this at home a couple of times a week rather than use bottled salad dressing. It's super quick--maybe two minutes at most, shorter than it'll take you to read this--and tastes a lot better. The main ingredients are always the same but I add different combinations of optional additions to keep things interesting. Splash the vinegar in a bowl with the salt and pepper and let the salt dissolve. Whisk in any optional additions with fork tines or a small whisk. Now for a bit of acrobatics. Drizzle oil with one hand while whisking with the other. Stop short and taste. If it's too tart add some more oil. Make the vinaigrette before you eat and dress the greens immediately before they go to the plate. If you need to wait a bit between making the vinaigrette and dining, you can cross the serving utensils in the bowl and lay the greens on top so they don't soak and wilt. Mix your fresh, dry greens with the vinaigrette directly in the bowl with your hands. If you like it peppery finish with another grind of Tellicherry Pepper. Serves 2-4, depending on how well dressed you like your salad. Your salami may have a natural, sticky white mold on it and that's OK. It's what helped it age and get so flavorful. It's edible, but you can also wash it off with a bit of vinegar and water if you'd like. If a little mold returns in time it's a good sign. We don't necessarily ship salami with ice packs. It's OK, the salami is totally safe. It's cured so it's healthy and happy at warm temperatures. To prolong its life at home keep it refrigerated. But hours or even days at warmer temperatures won't harm it a bit. We do not wholesale products we do not make. We'd be happy to help you find a source for them, however. Email us or ring 888.636.8162 or text 734.436.2006 and we'll do our best. If you're interested in what we do make we'd love to talk. Visit any of our wholesale business websites to learn more. Hearth-baked breads and traditional pastries. Old fashioned candy bars and confections. Varietal coffees, roasted in small batches. Fresh and aged artisan cheeses. Add $10 to above rates. Four Business Day Relaxed takes 5-8 days. Two Business Day takes 3 business days. Wherever you see Ships for Flat Rate the item is eligible for $10.99 flat rate shipping. The charge is per address. You can order as much as you'd like and pay one flat rate. When you check out you'll learn when the items will arrive (usually 4 business days at most). If you need it there quicker, you can choose to upgrade to our guaranteed 1 or 2 business day service when you check out. Flat rate to Alaska and Hawaii is $20.99. Yep! Our checkout calendar allows you to pick the arrival date you'd like. You can select an arrival date up to one year in the future. That arrival date is the latest date your package will arrive, though it could arrive earlier. Your package will arrive by that day, sometimes as late as 9 PM. That date is guaranteed. Your package may arrive slightly earlier than the date you pick. $10.99 Flat Rate packages: up to three business days early. Two Business Day packages: up to one business day early. One Business Day Overnight packages are guaranteed to arrive on the exact day you choose. Why can't I choose some dates? Our carriers can't deliver our packages on Sunday. Saturday delivery is not available in all areas. Delivery by tomorrow is only available for orders placed before 5 PM ET. To choose a date in the future, click on "Need it to arrive a different date?" link below the list of shipping options and select an arrival date on the calendar. You can advance to any future month by clicking the arrow > in the upper right. You can't choose an arrival date in the past because we have not yet been able to perfect time travel. If you can't get the exact date you want while shopping online, give us a ring at 888.636.8162 and we'll do our best to get your package to arrive just when you want it. Order by 5 pm ET Monday through Friday and we can ship your box out the same day. You can choose to have your box arrive the next day at the earliest using overnight shipping. Overnight arrival days are Tuesday – Friday. Saturday delivery available to some areas. Order by 5 pm ET Monday through Wednesday and we can ship your box out the same day. You can choose to have it arrive two days later at the earliest (e.g. Monday by 5pm arrives by Wednesday). If you order a box and select Two Business Day Service Thursday through Sunday, the earliest we usually ship is the following Monday. That way we're cool to the food and it doesn't sit alone in a warehouse over the weekend. Nope. We authorize our carriers to leave your package at the recipient's address without a signature. That way the recipient doesn't have to be home to accept it and the food doesn't suffer from multiple delivery attempts. When we can, yes. Our carriers do not offer this service to all locations. If it is available, you'll be offered a date on your checkout calendar. If you have any questions, email service@zingermans.com or call 888.636.8162 or text 734.436.2006 and we'll help! Sorry, no. We don't ship on weekends. We ship Monday through Friday. If you place your order after 5pm ET Friday we will ship your order on Monday—or whenever you want after that. We can send food to all 50 states and Washington D.C. Unfortunately, we can't send Zingerman's internationally. We'd like to help you find someone who can help you. Email service@zingermans.com or call 888.636.8162 or text 734.436.2006 and we can help. From late September to the end of March, you can skip right past this FAQ entry. From early April to mid September, we charge $10 additional shipping cost per shipping address for boxes shipping via Two Business Day Delivery with foods like cheese, meat and chocolate (but there's no additional charge for Flat Rate or Overnight shipping). That's the Warm Weather Care. Warm weather strikes each summer and wreaks havoc on perishable, melt-able food, like cheeses, meats and chocolates. It's hot in delivery trucks and warehouses even if it isn't too warm at the recipient's address. We employ an ice pack and insulation defensive strategy that ensures your shipment arrives in great shape. The extra packaging is reusable on picnics and road trips. We can't ship perishable products to P.O. Boxes, unfortunately. Our carriers can't deliver to them. If you're concerned that all you have is a P.O. Box, here are some frequently asked questions with answers that might be helpful. What if I have a Rural Route Number? Rural Route numbers are OK, our carriers deliver to them. Sometimes people confuse the two. Rural routes start with "R.R." What if I'm not shipping perishables? If you have non-perishables (things in bottles or tins, usually) we can often send them by USPS to a P.O. Box. Please give us a ring at 888.636.8162 or text 734.436.2006 and we can help you. Do they have a street address at all? Every house in America has a street address that any shipper can reach. It may not be the most common way to describe the address, but it almost always exists. Can I ship to a neighbor? Absolutely. If they promise not to gobble all the food! What other addresses can I ship to? If there's a UPS store or a Fed Ex office in the recipient's area we can arrange to ship there and they can pick it up. Many customers choose to ship to a work address. We can ship a limited selection of foods to APO and FPO addresses via the United States Postal Service Priority Mail. We cannot take these orders online but are very happy to help you by phone at 888.636.8162 or text us 734.436.2006 and we'll help. As you choose your foods, keep a few things in mind. It can take up to two weeks for delivery. The USPS doesn't guarantee delivery within a certain time frame, so sending perishables is too risky. We cannot send meats, cheeses, breads, coffees, and most baked goods. Glass bottles and jars are also risky for breakage as these packages tend to get very rough treatment. Per address, shipping charges are estimated USPS rates. We can ship to Alaska and Hawaii. Shipments to these two states cost $10 extra per address. There are some quirks about shipping to these two states. For our non-perishable foods that qualify for Flat Rate Shipping, the extra day in transit won't make a difference. Shipping by Two Business Day Service to Alaska and Hawaii takes three days. Not all our foods can last three days in transit. If your cart contains a food that won't make it in three days, we'll require One Business Day Overnight Service (that's what our carriers call it, but it may actually take two business days to arrive). We don't ship Two Business Day packages over the weekend in order to protect the food. That means the deadline for a same-week delivery to Alaska or Hawaii is Tuesday, 5pm Eastern Time. Orders placed by 5pm ET on Tuesday can ship that same day to arrive by Friday. Shipping by Two Business Day isn't available to all parts of either state. In those cases we must ship by Priority Overnight. That service is not guaranteed to take one business day, however. I know, it confuses us, too. But we're here to help you sort this out: call us at 888.636.8162 or text 734.436.2006 and we'll help. 1. Order online and use our standard delivery options. This is the cheapest method for most orders. 2. If you'd prefer to use our local courier we can arrange that by phone at 888.636.8162 or by text at 734.436.2006. Picking up your order at our warehouse is free, so it can save some money by skipping the shipping cost. Our warehouse is located at 720 Phoenix Drive in Ann Arbor, MI. Arrange your pick up by phone at 888.636.8162 or online during checkout. When we ship flat rate we allow our carriers leeway with their delivery dates. They can take up to a week to deliver (though it's usually sooner). That's something that's OK to do with foods that are durable. Unfortunately, bread isn't. It perishes sooner, so we ship with a guaranteed arrival date by Two Business Day service. In the wee hours of the morning the night after your box ships, we'll send a tracking email to you. From that email, you can click through to track your package on the carrier's website. You can also cut and paste the tracking number into the carrier's website directly. If you have an account on our website, you can also track your package once it has shipped by logging into your account, going to My Account, and then going to your Order History. Choose the order you want to track and you'll find tracking information right at your fingertips. There are a couple of exceptions to this rule. If you order gift cards or books, they'll ship via USPS, and there won't be any tracking information.